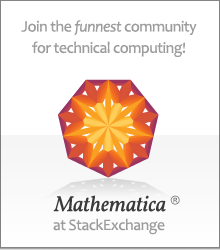 If you’ve never heard of Wolfram Research’s Mathematica, click here for a brief explanation, or use the What is Mathematica link in the navigation sidebar on the left side of this page. Verbeia.com’s Mathematica site is produced by Luci Ellis and Ted Ersek, and maintained by Luci Ellis. Please contact Luci by email at luci@verbeia.com if there is anything we can do to make the site more useful to you.